The celebrations were held in the Ontario Room, McDonald Block. With two Award Recipients and many distinguished guests, the evening was a pleasant one with a delicious dinner, beautiful decor, colourfully dressed ladies and lively conversations. His Excellency Farid Shafiyev, Ambassador of Azerbaijan, was recognized for his "distinguished career and outstanding service as a Counsellor, Charge d'Affaires and Ambassador to Canada and for his passion to serve his country". H. E. Farid Shafiyev is currently one of the youngest ambassadors in Ottawa and has done a remarkable job in improving relations and trade with Canada. Charming, intelligent and hard working, he is very approachable and makes a great impression on those he meets. 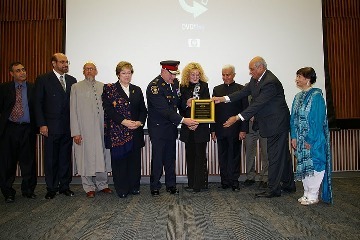 Chief Armand La Barge of York Regional Police was recognized for his "distinguished career, outreach work and outstanding public service as a police officer for 37 years in York Region". Chief La Barge has made a big difference in reaching out to the communities not only in York Region but also in other regions around the GTA. As President of the Ontario Association of Chiefs of Police, he has been instrumental in improving relations between the various police services in the GTA. 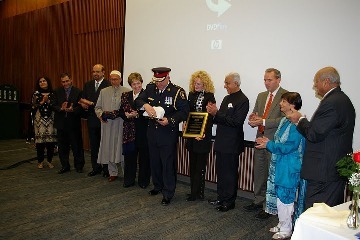 When he became Chief of York Region, the first function he attended was the Eid celebrations at Queen's Park in 2002. Chief La Barge has always attended all the annual events organized by the Association. He received standing ovations after he spoke at the Eid-ul=Fitr celebrations at Parliament Hill on September 22, 2010 and at the celebrations here at Queen's Park. His Excellency Farid Shafiyev and Chief Armand La Barge were presented with plaques and with Sandulak's polar bear sculptures titled "Northern Titan". Before dinner, President Obama's speech at the Iftar Dinner he held for American Muslims at the White House was shown. Many asked for copies to share with friends and family members. In his welcome address, Mobeen Khaja spoke about the significance of Hajj and also how the Eid celebrations started at Parliament Hill, Ottawa, and at Queen's Park, Toronto. Excellency Farid Shafiyev spoke about the importance of ideology and said: "Reflection about so-called standoff between the West and Islam leads me to the examination of causes of mistrust and animosity between some people, including policy-makers, media representatives, and clerics in Western and Islamic countries." He said " it is necessary to understand the ideology of extremists and to counter it with one’s own in order to combat terrorism successfully. Economic reasons, including poverty, are only partial explanations for the growing popularity of terrorist groups" and that "Paradoxically, a Marxist idea, asserting that all social problems are driven by economic reasons, is now more employed by Western policy makers to explain the root causes of terrorism and ethnic conflicts. Economy plays a significant role but not an exhaustive one in the phenomenon of terrorism". Please click here for his speech. We appreciate the generosity of our sponsors. GOLD TABLES: 1. CULTURAL CENTRE OF IRAN IN CANADA 2. 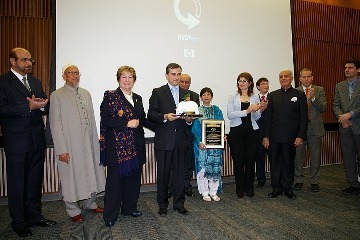 DR. DILKHUSH PANJWANI & SHAHNAZ PANJWANI 3. MR. MOE ANWAR - RBC DOMINION SECURITIES 4. NORTH AJAX MEDICAL 5. RBC FINANCIAL GROUP 6. SUPER-PUFFT SNACKS CORP. REGULAR TABLES 1. ASSOCIATE BUSINESS CONSULTANTS 2. FIVE WAYS FINANCIAL INC. 3. MRS. GHALIA HANIF & MR. SAJJAD HANIF 4 KPMG - TORONTO 5. TRANSGLOBAL SYSTEMS OF CANADA INC. Presentation of plaque to H. E. Farid Shafiyev. 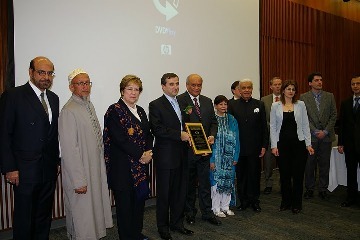 Some members from the Azerbaijani community are on the right Some APMO Board Members are also in the photo. Presentation of plaque to Chief Armand La Barge. Some Board Members from APMO are on both sides. Hon. Janet Ecker is on the left of Chief La Barge and Mrs. Denise La Barge is on his right. Presentation of the gift to H. E. Farid Shafiyev. Some members from the Azerbaijani community are on the right Some APMO Board Members are also in the photo. Presentation of the gift to Chief Armand La Barge. Some Board Members from APMO are on both sides. Hon. Janet Ecker is on the left of Chief La Barge and Mrs. Denise La Barge is on his right.